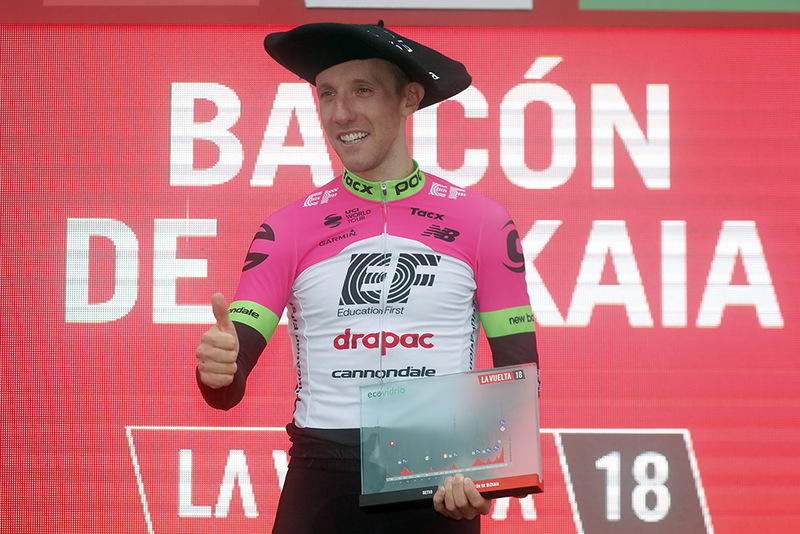 The dreaded ascent of the Alto del Balcon de Bizkaia offered a major showdown with Michael Woods (Education First-Drapac) taking a spectacular win ahead of Dylan Teuns (BMC Racing Team). 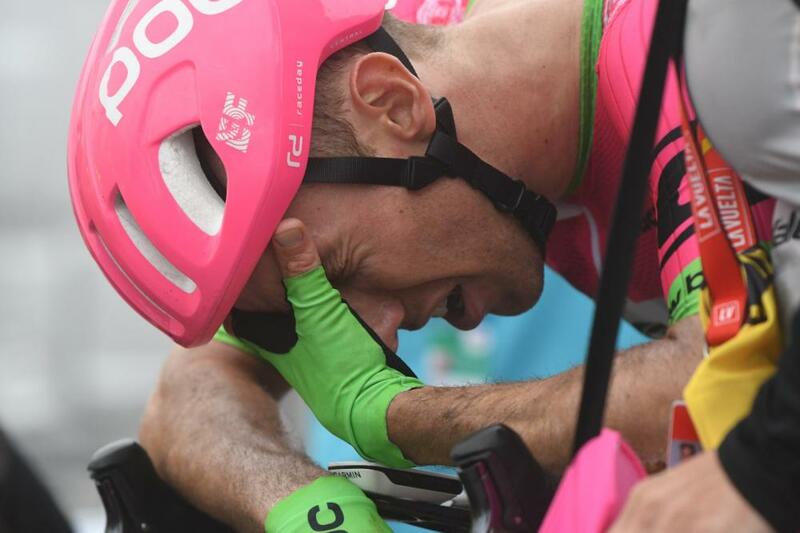 The Canadian climber went for the early breakaway and dominated climbers such as Rafal Majka (BORA-hansgrohe) and Vincenzo Nibali (Bahrain-Merida) in the final climb featuring slopes up to 24%. Alejandro Valverde (Movistar Team) was the strongest of the GC contenders, gaining 8s on Simon Yates (Mitchelton-Scott), who retains the red jersey. Nairo Quintana (Movistar Team) lost one minute and dropped out of the top 5. 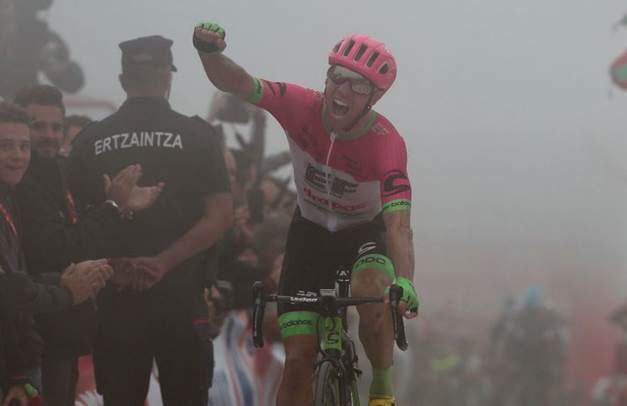 As expected, and as usual at La Vuelta 18, the battle for the breakaway was extremely intense. Basque riders attacked as soon as the race reached km 0 in Bilbao. 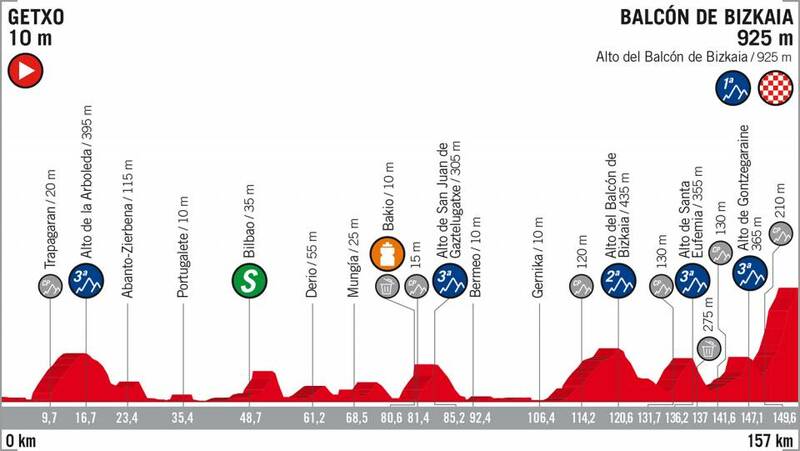 Michal Kwiatkowski (Team Sky) and Ben King (Dimension Data) were among the early attackers but it took 15km for a strong group of 21 riders to get away in the last part of the Alto de la Arboleda: Vincenzo Nibali (Bahrain-Merida), Alexandre Geniez (AG2R-La Mondiale), Omar Fraile (Astana), Alessandro De Marchi, Dylan Teuns (BMC Racing Team), Rafal Majka, Lukas Pöstlberger (Bora-hansgrohe), Thomas De Gendt (Lotto-Soudal), Andrey Amador (Movistar Team), Amanuel Ghebreigzabhier (Dimension Data), Simon Clarke, Michael Woods (Education First-Drapac), Ilnur Zakarin (Katusha-Alpecin), David De La Cruz, Jonathan Castroviejo (Team Sky), Jai Hindley (Team Sunweb), Bauke Mollema (Trek-Segafredo), Cristian Rodriguez (Caja Rural-Seguros RGA), Jesus Herrada, Stéphane Rossetto (Cofidis) and Hector Saez (Caja Rural-Seguros RGA). They had opened a gap of 2:30 after 35 km when five more joined them at the front as the race approached the last 100km: Franco Pellizotti (Bahrain-Merida), Pieter Serry (Quick-Step Floors), Merhawi Kudus (Dimension Data), Valerio Conti (UAE Team Emirates) and Jose Mendes (Burgos-BH). 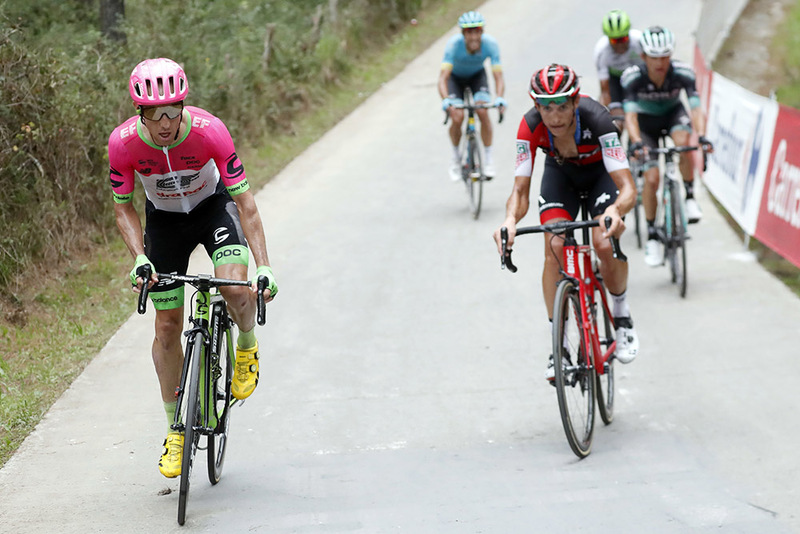 At the summit of the Alto de San Juan de Gaztelugatxe (km 85.2) the gap had stabilised around 8m with Simon Yates’ Mitchelton-Scott driving the bunch. 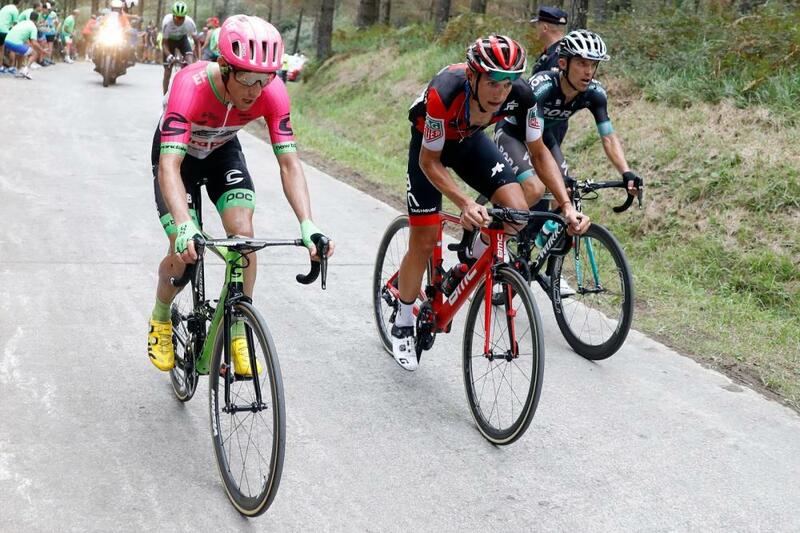 Euskadi-Murias upped the tempo in the last 60km and the gap was reduced to 5:18 atop the first ascent of the Balcon de Bizkaia (36km to to go), where Thomas De Gendt moved ahead of Luis Angel Mate (Cofidis) in the KOM standings. The attackers still enjoyed a 3m lead at the bottom of the final climb (7.3km at 9.7%), more than enough to battle it out for the stage victory on slopes with up to 24% grade. 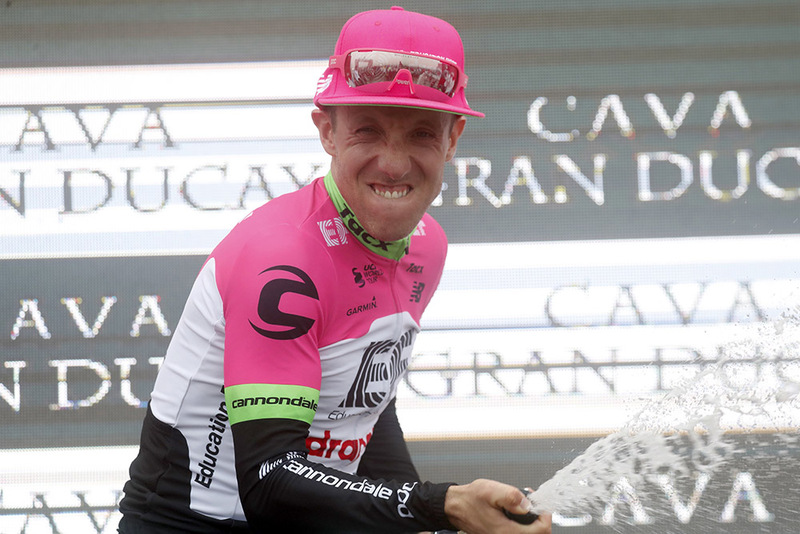 Rafal Majka, Michael Woods, Dylan Teuns and David de la Cruz were together for the final kilometre, where the Canadian lunched a very strong effort to open a gap and then held off of Dylan Teuns. In the GC group, Astana set a very hard pace and Nairo Quintana (Movistar Team) was dropped with 3km to go. Adam Yates (Mitchelton-Scott) then set the pace for his brother, until Enric Mas (Quick.Step Floors) accelerated in the final kilometre. Alejandro Valverde (Movistar Team) followed him and they gained 8s on Simon Yates, whose GC lead is down to 25s. Enric Mas moves up to third place ahead of Steven Kruijswijk (LottoNL-Jumbo). Nairo Quintana (Movistar Team) is out of the top 5 after losing 1:04 on Vavlerde. 11 Stephane Rossetto (Fra) Cofidis, Solutions Credits s.t. 15 Alejandro Valverde (Esp) Movistar Team s.t. 23 Nairo Quintana (Col) Movistar Team s.t. 34 Thomas De Gendt (Bel) Lotto Soudal both s.t. 52 Sergio Pardilla Bellon (Esp) Caja Rural-Seguros RGA both s.t. 54 Eduard Prades Reverter (Esp) Euskadi Basque Country-Murias s.t. 56 Sergio Luis Henao Montoya (Col) Team Sky s.t. 59 Fabio Felline (Ita) Trek-Segafredo both s.t. 65 Pavel Kochetkov (Rus) Katusha-Alpecin both s.t. 72 Jan Hirt (Cze) Astana Pro Team s.t. 79 Dario Cataldo (Ita) Astana Pro Team all s.t. 85 Edward Ravasi (Ita) UAE Team Emirates both s.t. 90 Luis Guillermo Mas Bonet (Esp) Caja Rural-Seguros RGA both s.t. 93 Johannes Fröhlinger (Ger) Team Sunweb s.t. 103 Vegard Stake Laengen (Nor) UAE Team Emirates all s.t. 106 Richie Porte (Aus) BMC Racing Team s.t. 115 Sander Armee (Bel) Lotto Soudal s.t. 117 Antoine Duchesne (Can) Groupama-FDJ s.t. 119 Joey Rosskopf (USA) BMC Racing Team s.t. 121 Marc Sarreau (Fra) Groupama-FDJ s.t. 127 Mitchell Docker (Aus) EF Education First-Drapac p/b Cannondale both s.t. 142 Louis Meintjes (RSA) Dimension Data all s.t. 145 Jay McCarthy (Aus) Bora-Hansgrohe both s.t. 148 Kasper Asgreen (Den) Quick-Step Floors s.t. 150 Jelle Wallays (Bel) Lotto Soudal s.t. 157 Luka Mezgec (Slo) Mitchelton-Scott all s.t. 160 Simone Consonni (Ita) UAE Team Emirates s.t.